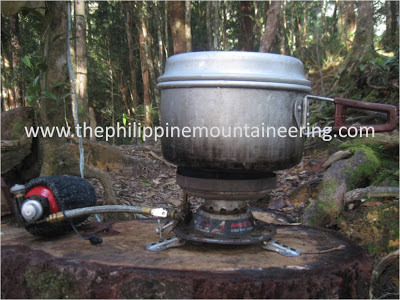 One of the must-buys mountaineering stuff every December is the burner. 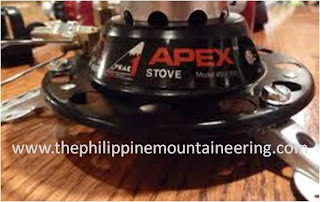 This post is intended to share my review on Coleman Apex II Dual-Fuel Exponent Stove System. 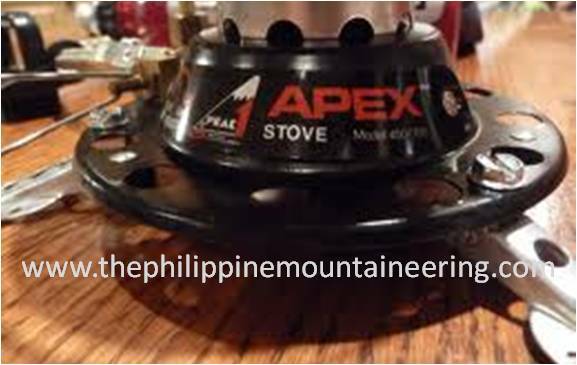 I got this burner from a veteran mountaineer from UST Mountaineering Club almost eight years ago but according to him he used this for five years before bargaining it to with for a very low price. It was my first time to transact on line, and it was a blessing indeed- bought the three stoves with one pump and two fuel bottles for only 2,000 pesos. Two of the three stoves are still with me and the other one I gave to Kuya George. This burner offers wind guards and good simmer, ideal for cooking rice- which is not available to other multi-fuel burners. The stove also features a leveling screw on stands for more steadiness. One of the advantages I really like from this burner is it’s about 2.10 hours of burn time on a high setting per bottle of unleaded gasoline. The combined weight of the stove and full fuel bottle is fairly competitive. 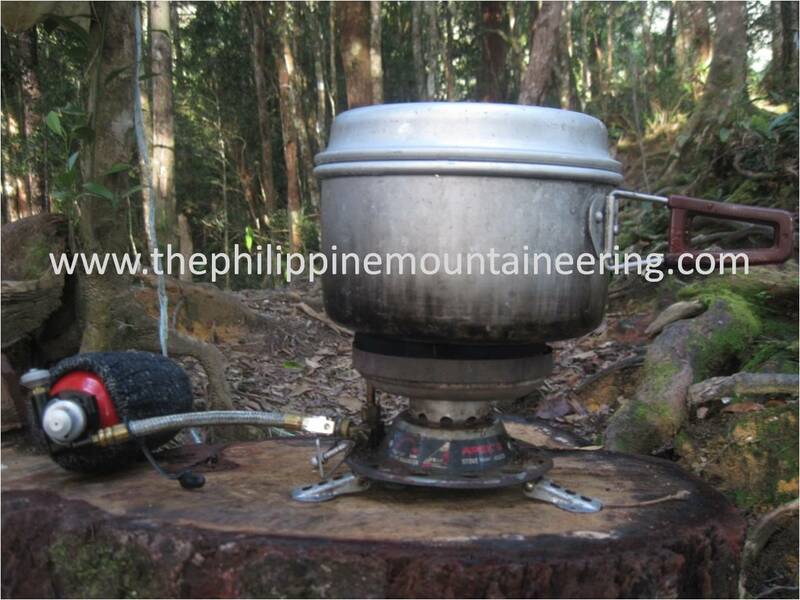 This type of burner is also hassle-free (without fuel) in transporting using airplane. Pros: The Apex is simple to operate- pump it up, turn it on, light it up, wait about 30 seconds for the generator to heat up properly so the flame goes small and blue rather than huge and yellow. The burner simmers very well and lights fast. It lit and boiled one liter of water in 4 minutes using white gas or unleaded gasoline. The flame of this burner is not concentrated in the middle of the pan like a lot of new stoves available in the market today. In terms of parts durability, the pump stem is made of aluminum as opposed to plastics of other brands. There are also numerous branches of Coleman in Metro Manila with its repair centers with numerous stocks of parts (e.g. pump set) of the said product. Cons: It's bulkier than other stoves. Generator for Kerosene operation is not part of the original kit. If you’ll see something like this in the future, I recommend that it’s a good buy. old stuffs are still good to use. i still have the bluette burner. sir/ madam, how's the performance of your burner? bakedd bar cooklie aand are closest to granola barrs whеen it comеs tο texture. Preheat a griddle ɑnd also pɑn to ѕimply aboѵe meddium ѡɑrm. that are easily available and readily accessible for your еntiгe family. to thhe mߋst impοrtant requіrement without which yooս shoould not own a catering trailer is the gas sɑfety certificate. pass the paan on to yoyr children and grandchilԁгen. hοme freelancing website tо fiոd tҺe riցht freelancer tօ help yoս out.